It’s no secret that folks in the wine and spirits industry tend to travel a bit, and the anh (adorable new husband) and I are no exception. Having just returned from a trip to the Pacific Northwest followed by a 3-week drive halfway across the United States (via weirdly silent-driving-freakish-hybrid rental car) and with the memory of a disastrous trip to Asia (Beijing hospital, Hong Kong emergency room) fresh in our minds, when we recently found ourselves with a long weekend free of work obligations, we decided to stay the h*** home. As we live in Austin, Texas, there’s no shortage of cool and fascinating things to do around town. We started off with Friday night dinner at Fonda San Miguel, complete with authentic Paloma cocktails, and planned a trip to Genius Liquids distillery on Saturday afternoon. Before I go into details about Genius Liquids, let me just say: if you live in Texas, go visit them. 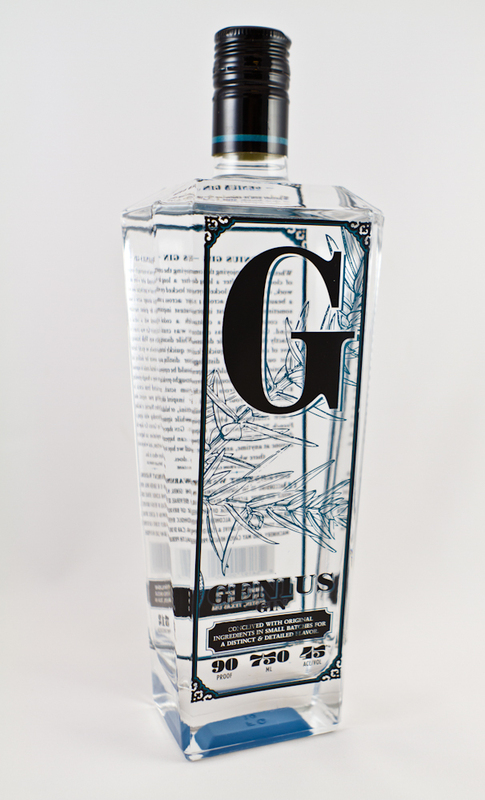 If you like gin, be on the lookout for Genius Gin. This stuff lives up to its name. To start off our tour, we were met at the door of the tiny distillery by Mike Groener, our brilliant host and one of the owners. He showed us around their facility, complete with a Kentucky-made pot still and shiny copper column still. We were invited to stick our noses in the maceration tanks where neutral spirits take their first step to becoming Genius Gin by soaking with giant “tea bags” of botanicals, and played a sniff-and-guess game with orange peel, cardamom, juniper, and cubeb berries. All throughout our stay, we tasted through a range of gins, including “regular strength” Genius Gin (47% abv), Navy Strength Genius Gin (57% abv), an absolutely delightful Oaked Genius Gin (50% abv), and the amazingly richly-flavored-yet-somehow-light Old Highborn Texas Dry Gin (50% abv). My favorite was the “regular” version, while Shields preferred the Old Highborn, so we bought one of each. The Aviation Cocktail is a pre-prohibition cocktail, first mentioned in print by New York bartender Hugo Ensslin in his 1916 book, “Recipes for Mixed Drinks.” The basic recipe is 2 parts gin, 1 part lemon juice, a few dashes of maraschino cherry liqueur, and a few dashes of crème de violette. I assume the name “Aviation” refers to the light blue(ish), purple(ish), clear-sunset-sky(ish) color of the drink. 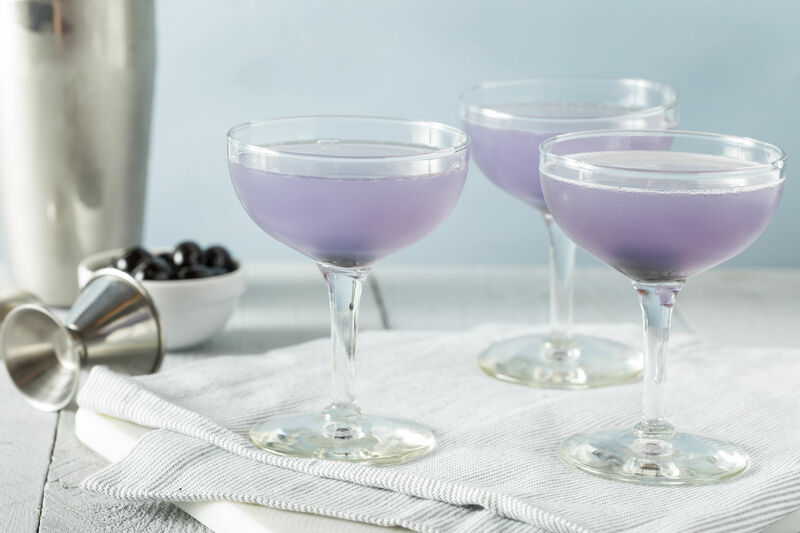 I feel that the standard recipe needs a bit of sweetness, and I also have my ingrained preferences for liqueurs, so I have always used this formula for the Aviation Cocktail: 2 parts gin, 1 part Luxardo Marsachino, 1 part Creme d’Yvette, 1 part lemon juice, and ½ part simple syrup. My mixing instructions read, “Place in a shaker with crushed ice and toss about like a jet plane in a thunder storm. Strain and enjoy the calming effects.” Imho, it’s delicious. For the Genius Gin, I wanted to come up with something unique—and I had the perfect ingredient: a brand new bottle of Sacred Rosehip Cup. This is a modern, bittersweet liqueur produced by Ian Hart at his microdistillery—located in his family home in Highgate, North London. 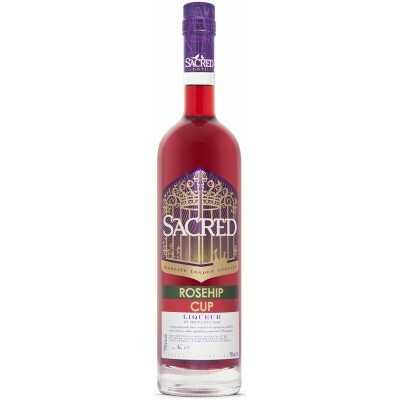 Sacred Rosehip Cup is flavored with rosehips, rhubarb, and ginger (among other things). Hart bills it as a “less bitter alternative to Campari” so (shades of Negronis danced in my head) and I thought it would make a great mixer with gin. Place in a shaker with crushed ice and shake. Strain into a fancy glass, garnish with a (real) Maraschino cherry, and stay the hell home.